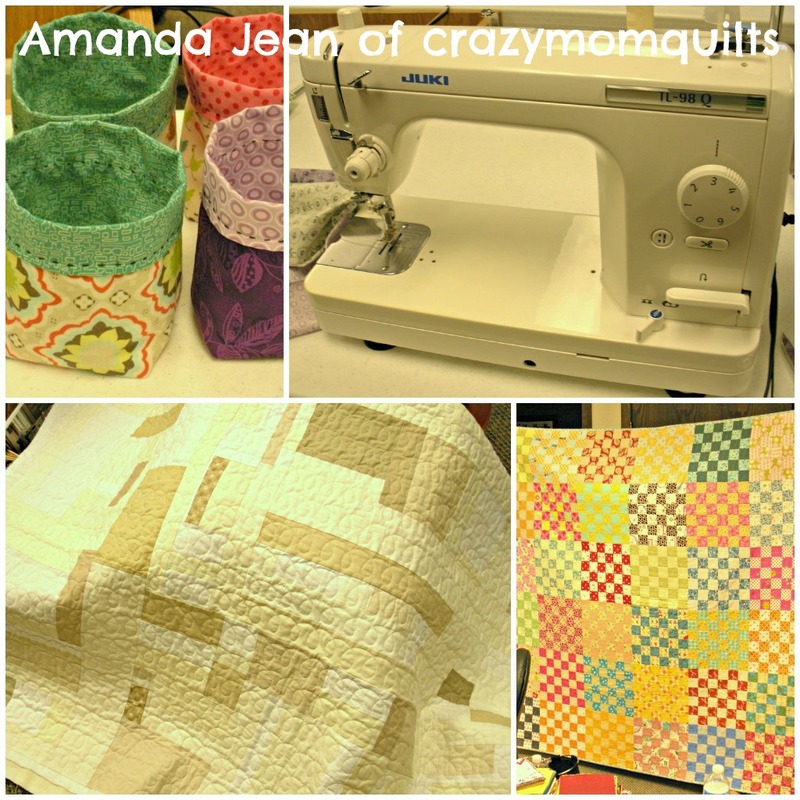 ← Quilting is my Therapy, too. At some point about midway through retreat last weekend, everyone decided on something to challenge themselves. Either a sewing skill they had never tried, or one they were uncomfortable with, learning a new craft or technique, or just stepping outside the box. It’s always good to push yourself a little, right? 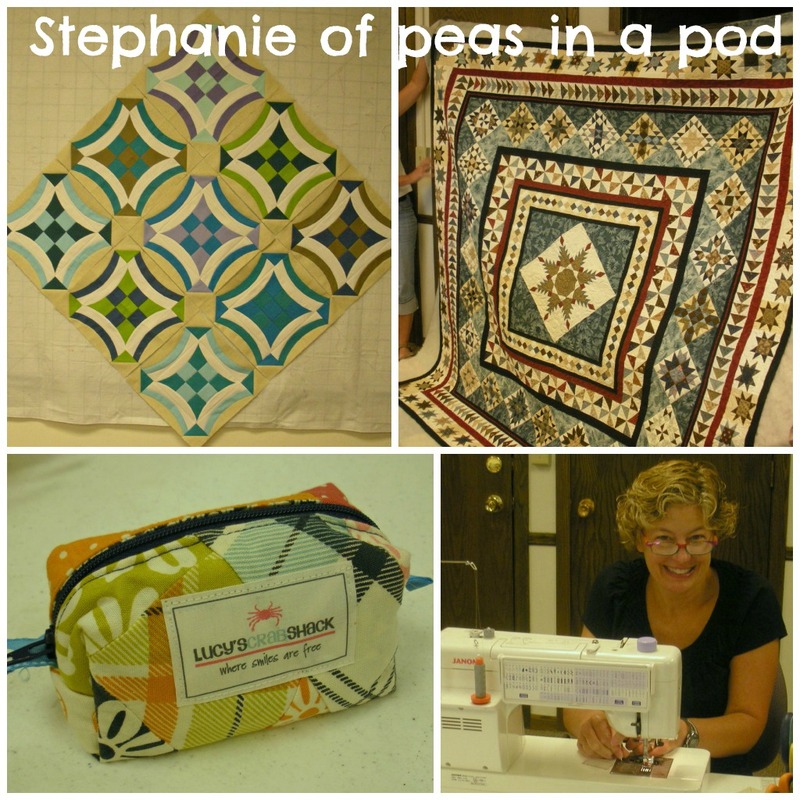 Stephanie chose curved piecing using her new Quick Curve Ruler (see those awesome Urban 9 Patch blocks?). She also brought along an amazing medallion quilt for show-and-tell, and her tiny duffle bag made from Lucy’s Crab Shack scraps was the envy of everyone of us! Cindy flew to Minnesota from California for retreat, along with her favorite Singer Featherweight (ahem. it’s my favorite, too). She has the most impressive selvage camera strap–seriously, what a great use of SCRAPS! And her llama quilt blocks are truly awesome! Cindy’s husband (a Minnesota native) joined her on Sunday and they were spending the rest of the week driving around Minnesota visiting family. 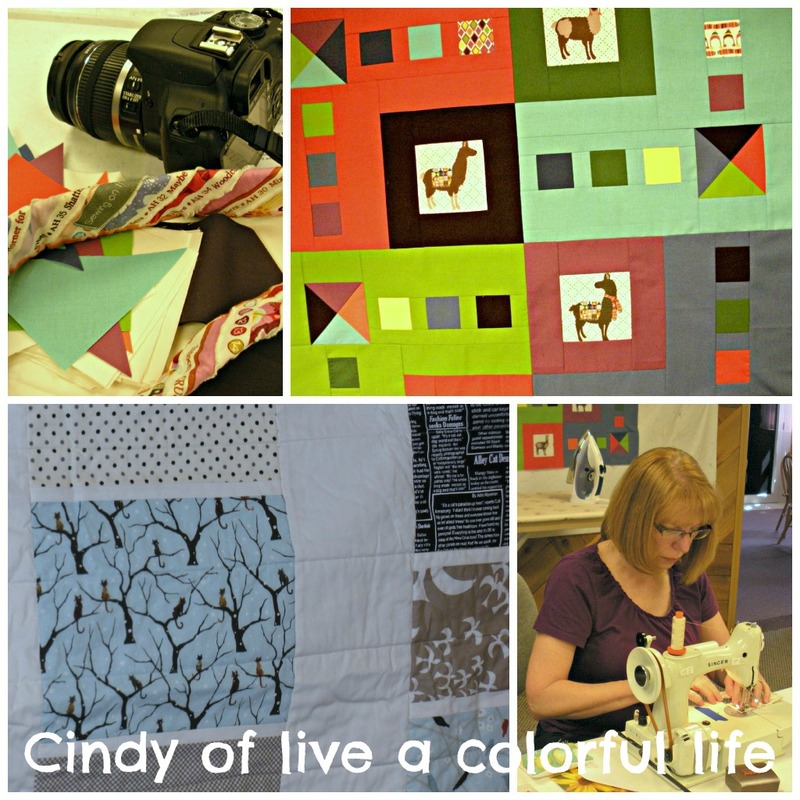 Cindy challenged herself to try free-motion quilting–and she liked it! Mary’s challenge was trying crochet, she was teaching herself from a book she won on Cindy’s blog last week–studying and learning with all that activity going on around her! She brought along an intricate piecing project that she hadn’t touched since February, that’s it in top left photo–she nearly completed the top and my photo does not do it justice! Rene flew in from the Pacific Northwest to join us, and brought along three beautiful show-and-tell quilts, including the peace sign quilt same made for her first grandson, who is just a few weeks old. 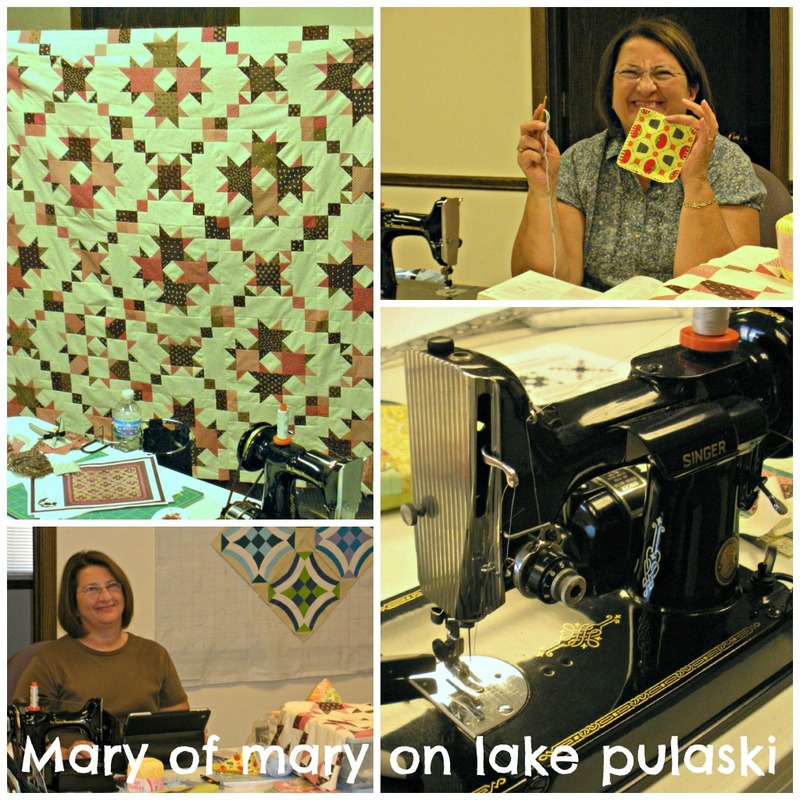 She worked on a shot cotton quilt, with fussy cut cowboy (and cowgirl!) fabric, and even challenged herself to go 3-D with a pincushion project after some coaxing from the rest of us. Michelle, Rene’s little sister, joined us again this year from Georgia, and she still claims to be a new quilter, but this girl has made some serious strides! 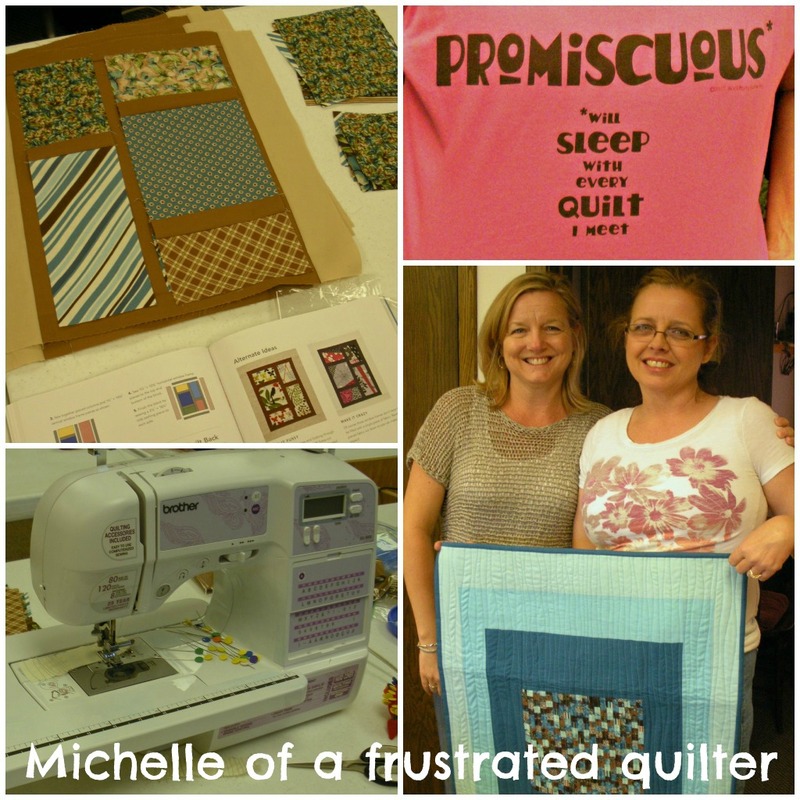 She even shared a quilt this year (a challenge for her), the mini quilt in aquas and browns that she made for her sister’s birthday, that blew us all away–it’s beautiful! And the fabric she bought at Grubers last year made a return trip to Minnesota and were turned into some very pretty window blocks. I worked on my Love in a Mist Bee quilt top (it may actually be a quilt one day), cut oodles of 5″ hexagons for my niece’s quilt (thank you, Go! Cutter), paper-pieced blocks for a table runner from my scraps… and my challenge was to re-learn Adobe Illustrator, or at least enough to make diagrams for the newest quilt pattern. I was grateful to have Terri in the room to help when I got stuck. Diagrams drawn and complete! Do you challenge yourself to try new things? What sewing technique would you like to try (if nothing was holding you back)? What a wonderful showcase of everyone’s work!!! It was great seeing others step outside their comfort zones, as it reminded me that we all can challenge ourselves. One of my biggest challenges is in using brighter colors…I don’t know why I keep going to my “earthy” colors…Missing you much!!!! 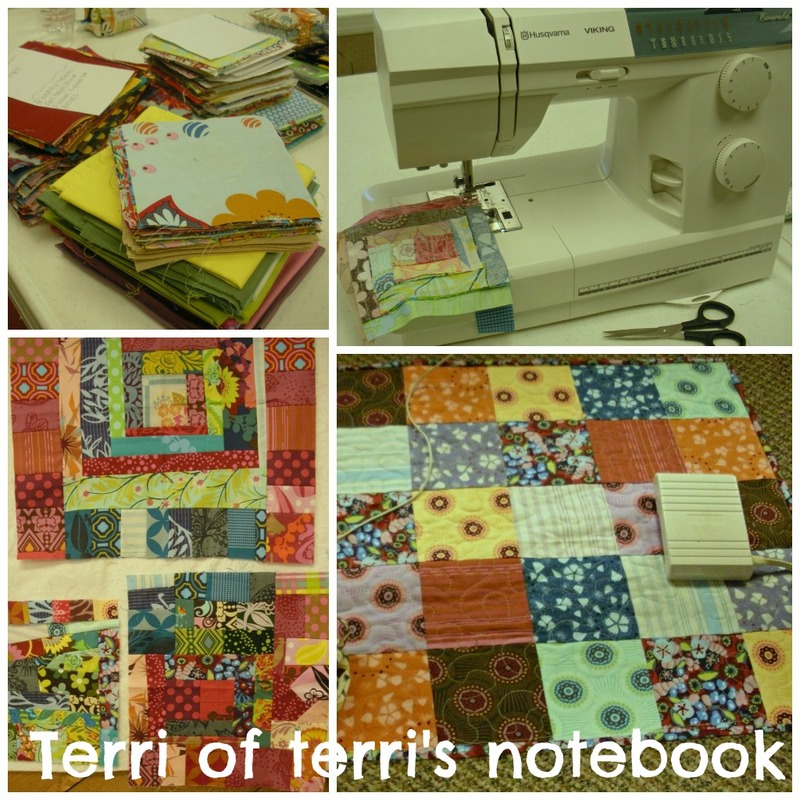 Doris, you did a great job of giving us a peek of just how inspiring and fun a quilt retreat can be, especially with the group that attended! It is good to bring your game up to the next level, whatever that may be. Great pictures, thank you for the share. Great recap! 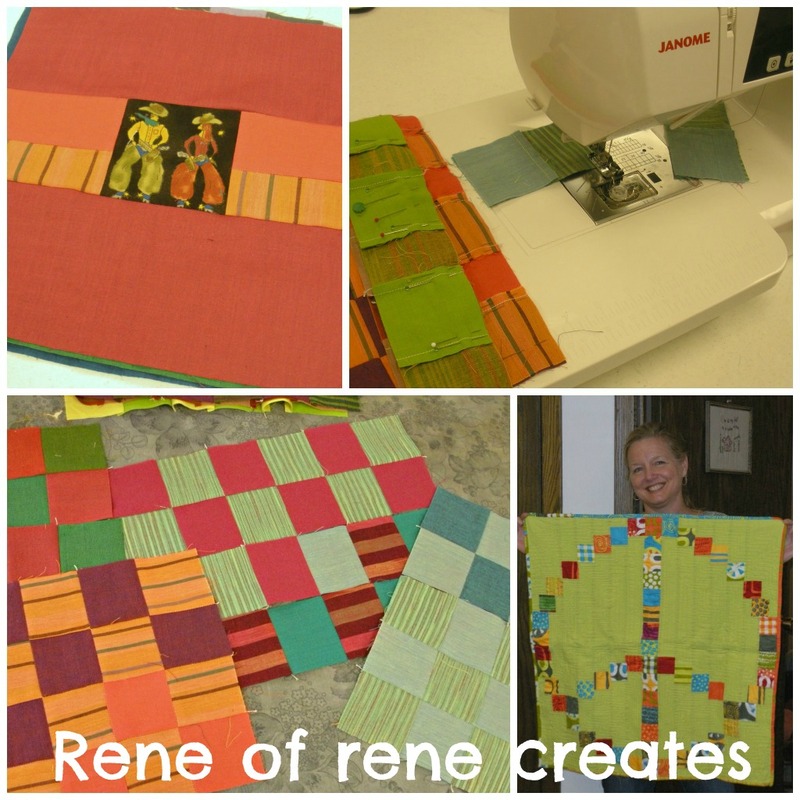 I love the collage of photos you put together for each person’s process and projects. I also loved reading about each person’s challenge. I don’t think I had a specific challenge, or didn’t voice it. My challenge was and continues to be to use my scraps. I’ve never been very good at using my scraps. In fact, I used to give them away, mostly to Amanda Jean. I had a lot of fun digging through that box of AMH scraps I brought along. It continues to be my challenge, to use my scraps. I also feel like I might need a new challenge, quilt-specific. I used to do a lot of piecing but have moved to more patchwork square piecing these days. Trying to figure out what to try next? This was an awesome post Doris! Thanks for taking the time and effort to put it together – I really enjoyed it. Can’t wait to see what our challenges will be next year!! I loooove this post! It’s so fun to see everyone’s machines (babies) and their projects.I love them all! Right now I’m teaching myself applique. I had a single lesson on how to “fake” the needle-turn look using fusible interfacing. It’s a quilt from a class, but life got in the way of the class. So far I’m loving it! I just need the time to actually sit down and do it. I’ve got task ADD. LOL! 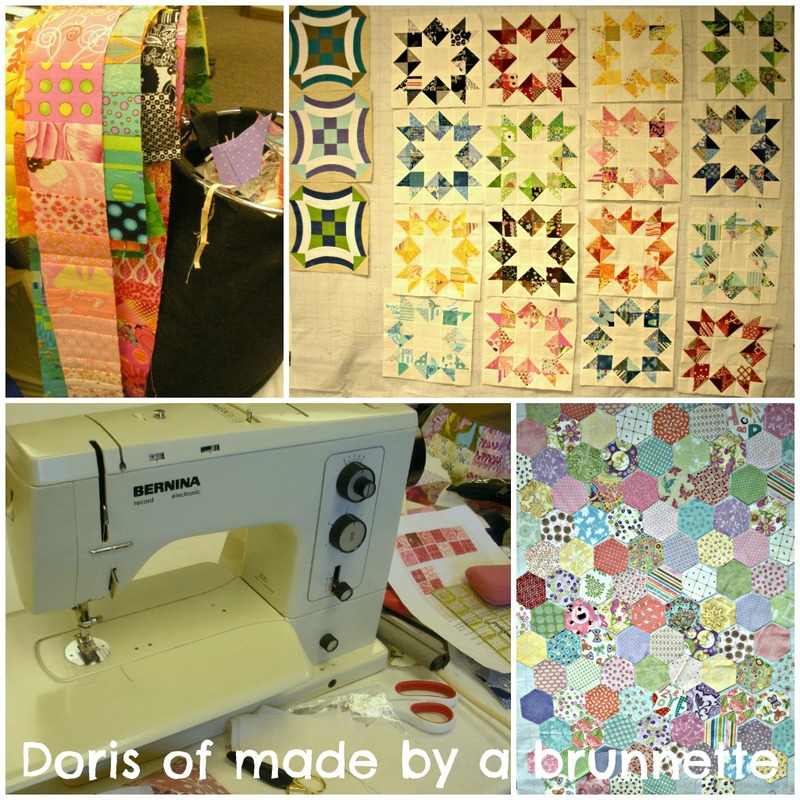 Doris, I totally love this post from our retreat! Wow! Your collages and how you captured everything. It’s really awesome. Thank you! I hope you are well! What’s my next challenge. I emailed my SIL and asked her to help me crochet. I want to do that quilt Cindy and Mary are working on. 🙂 Oh, and I have plenty of other challenges, too. One day you need to show me how you do these photo collages on your blog! I love these and how you captured each person’s work space and projects. I appreciate you not showing the end result of my “challenge” which I have to say was issued when I was not in the room 😉 !!! I do need to challenge myself more and I have a long list….making a better “3D” project, learning to crochet, Photoshop, just to mention a few. I love seeing all your projects and am glad your pattern is ready….when can I place my order? LOVE this post so much. It just made me feel all warm and fuzzy. What great friends you are! Can’t wait until next year!